101118 - Up to a slow start. Couple calls then ran to pick up G from school. 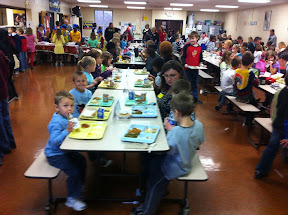 G&I hiked back to the school to have a spectacular good and fun turkey lunch with Jacky boy! Back to the desk to finish the day. Out for dinner with the fam and then all ready for the cake auction. 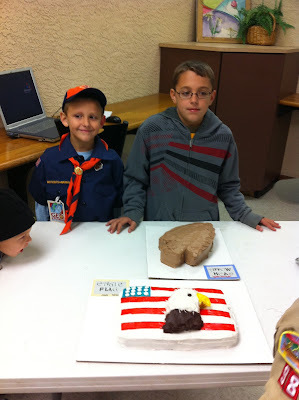 Here are my bakers with their cool cakes. 101117 - Up early, saw the boys off to school and then headed to Cleveland. I drove to the meeting and listened to 'Think and Grow Rich" on the iPhone to pass the time and for the class I am taking. I got to the meeting and had a nice lunch and then many hours of meetings where I didn't get to say a word, and then the other two guys in my team took off... There I was all by myself with a handful of people that had been talked to for hours and dying to go back to their cubes. So I gave a 20 minute overview, putting them to sleep and tried to make a graceful exit. Further South to the Farm. Mom, Dad and I to a new restaurant where 'Mom's' use to be. It was a good dinner and and really nice to relax and have a kid free conversation. Further South and saw the boys for a bit before they headed off to bed. Up late and working on the PC.